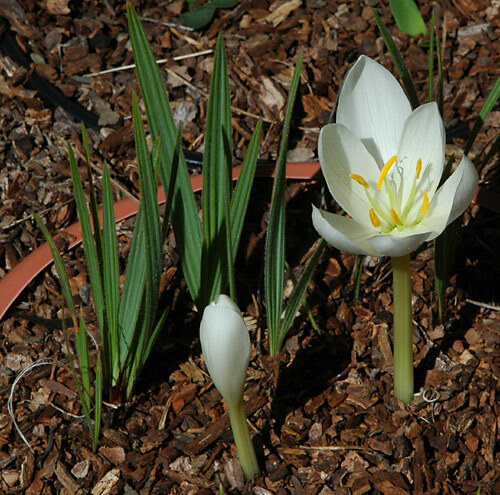 Colchicum sanguicolle Photos by Jane McGary. 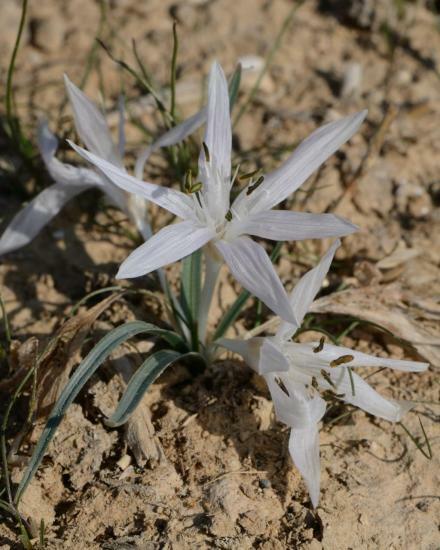 This species, little known to cultivation, grows in the mountains of southwestern Turkey and is distinguished by the deep red prophyll (sheathing leaf) visible in one of the photos just above the soil surface. 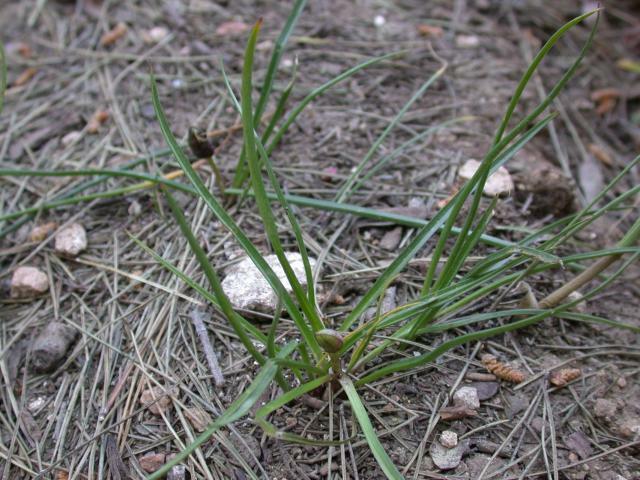 It grows among rocks and in short grass, but the largest colonies appear to be in duff just downhill and outside the drip line of large Cedrus libani (cedars). 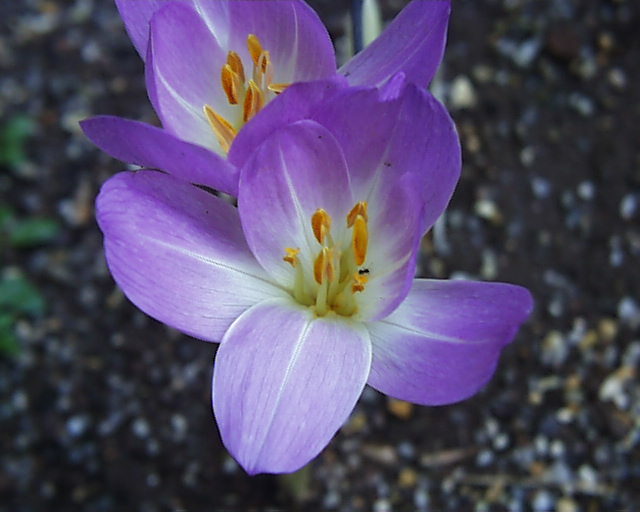 It is a medium-sized colchicum about 10 cm tall in flower. 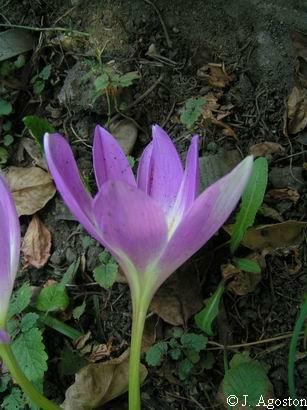 Colchicum serpentinum Woronow ex Miscz. 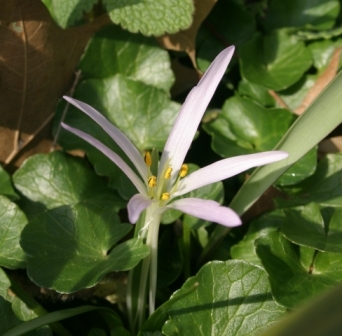 is a spring flowering species from Turkey. Photo from John Lonsdale. 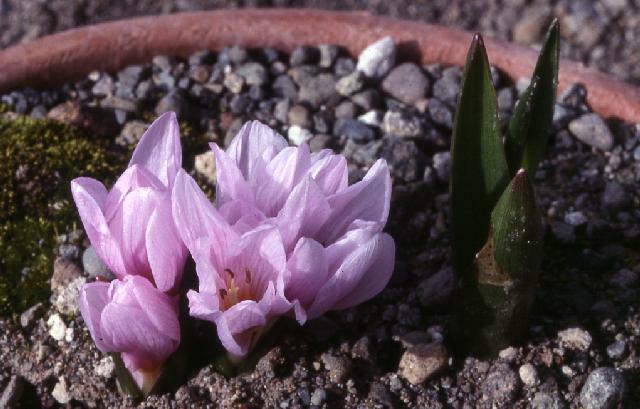 Colchicum sibthorpii Many references say this is a synonym for Colchicum bivonae. Photos by Arnold Trachtenberg. 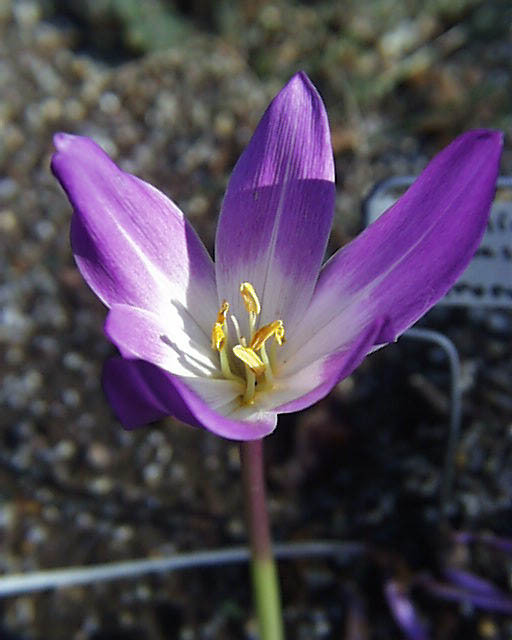 Colchicum soboliferum (C.A.Mey.) Stef. (syn. 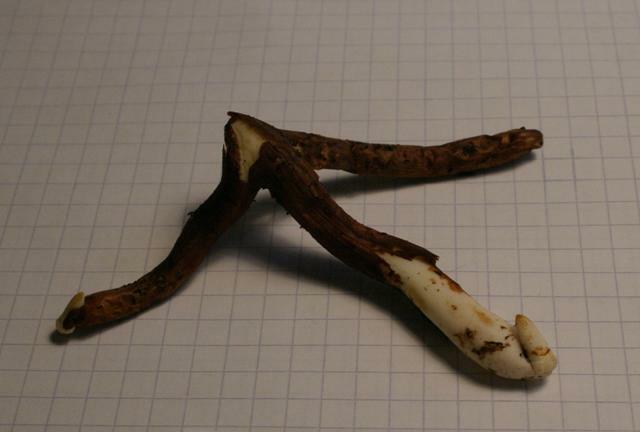 Merendera sobolifera C.A.Mey., Bulbocodium soboliferum (C.A.Mey.) Heynh.) 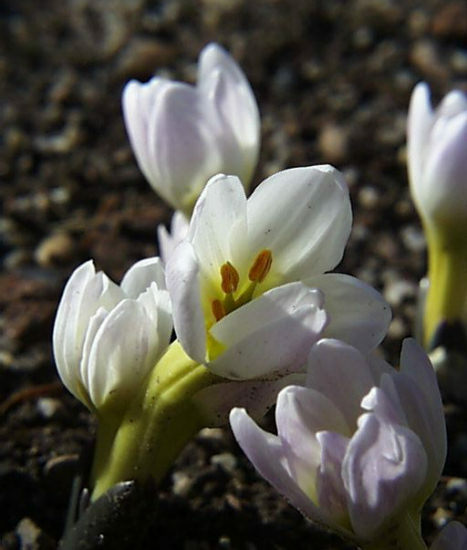 is a near-eastern species which blooms in late winter or early spring. 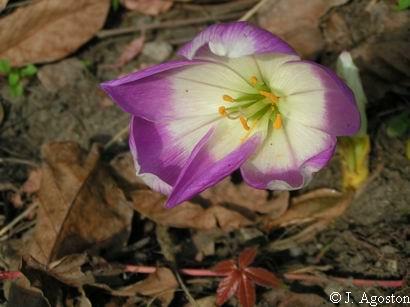 It was in bloom on March 15, 2008 in the zone 7 Montgomery County, Maryland, USA, garden of Jim McKenney. 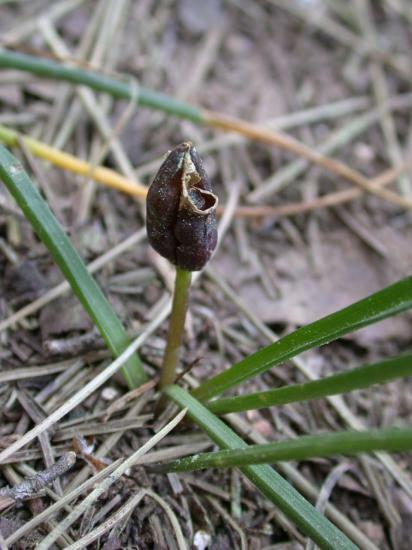 The first image shows the unusual corm(against a quarter inch grid): it resembles a cluster of Gloriosa corms. 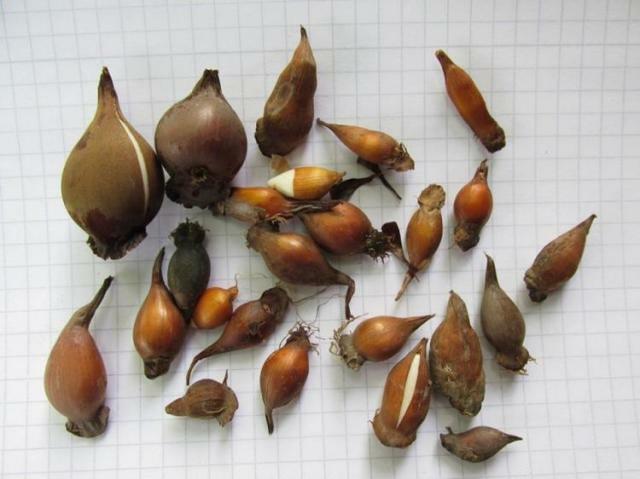 In the middle image if you look carefully you can see under the colored portions of the bloom the basal portions of each tepal; they look like threads. 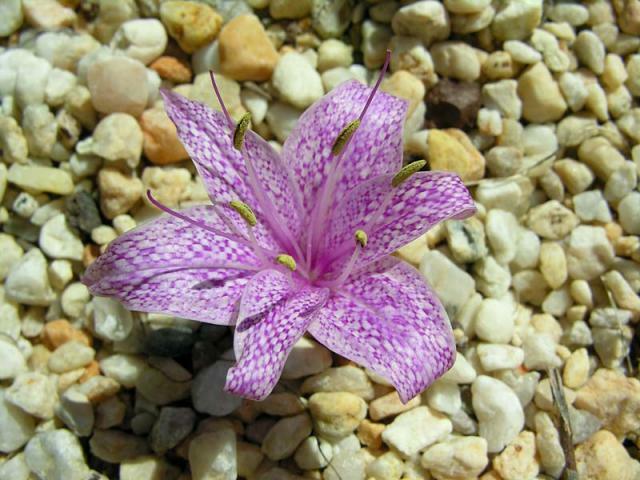 This is the salient characteristic of the genus Merendera. 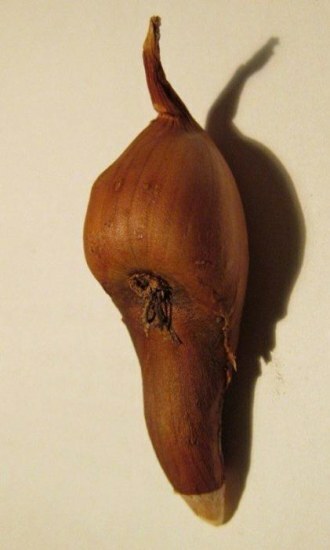 Just under the colored portion of the tepal they are hooked together in this species. 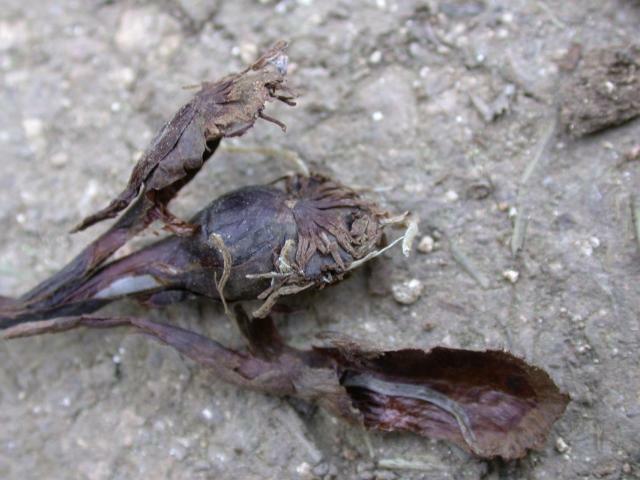 I gently pulled the tepals apart to get the third image, where you can see the "hooks" which hold them together. 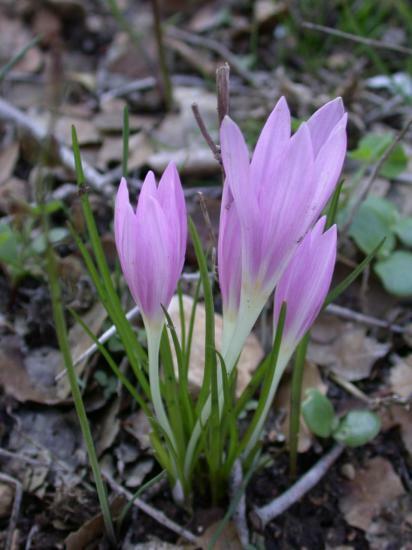 Colchicum speciosum is a fall blooming popular species native to Turkey and the Caucasus where it is found in meadows and light woodland. 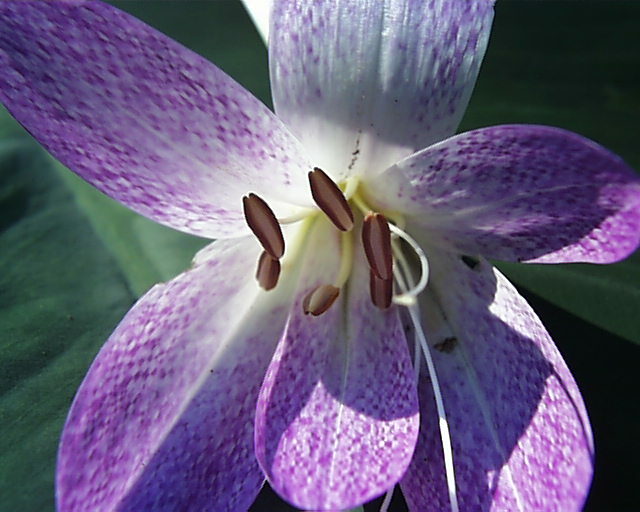 Flowers appear long before the leaves with flower color from pinkish purple to deep purple sometimes with a white zone in the throat. 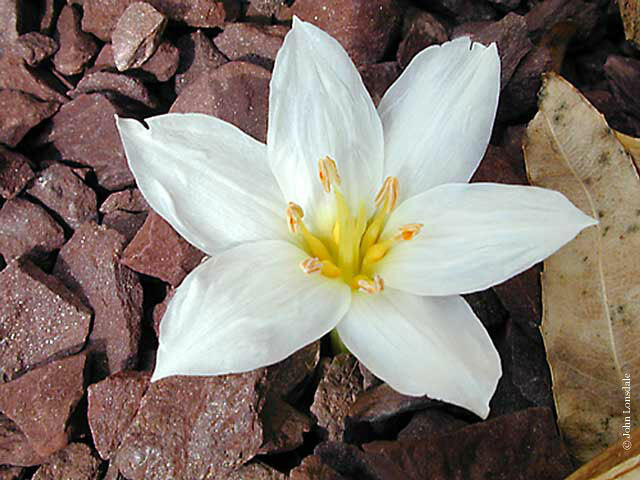 Photo 1 by Arnold Trachtenberg. Next two by Travis Owen. 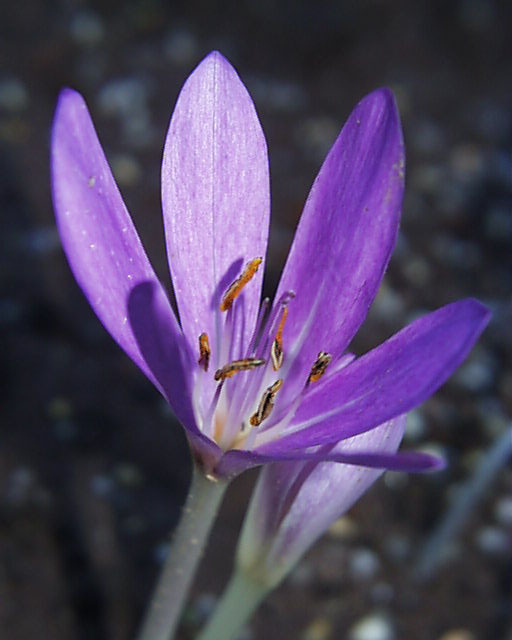 A form from Northern Turkey, once considered a species, but now included in Colchicum speciosum, Colchicum bornmuelleri has narrower leaves and purplish anthers. 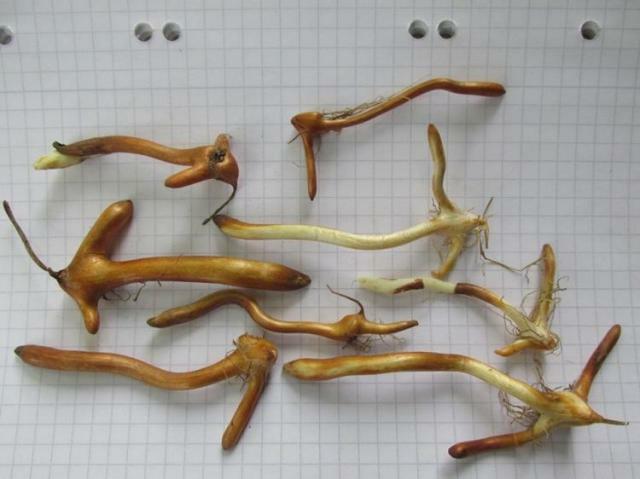 Photos by Janos Agoston of plants grown as C. bornmuelleri. 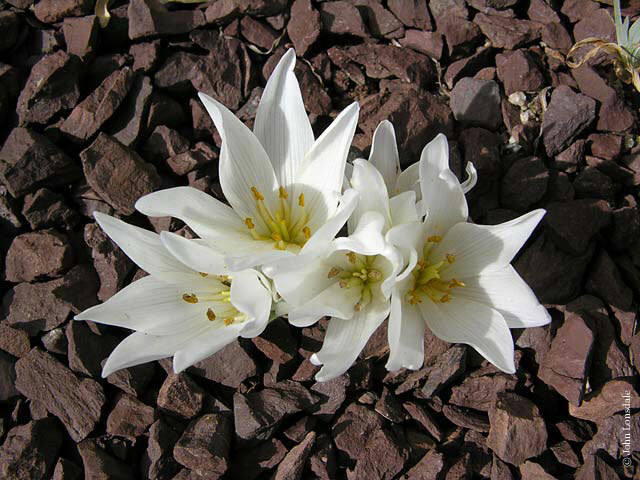 Colchicum speciosum 'Album' has huge pure white goblets tinged green in the throat and gets high praise as possibly one of the best autumn bulbs for the garden. 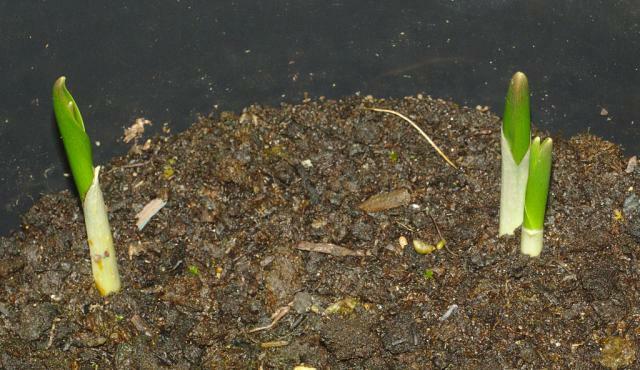 Photos by Mary Sue Ittner of plants growing in a container in a raised bed with Babiana leaves showing. 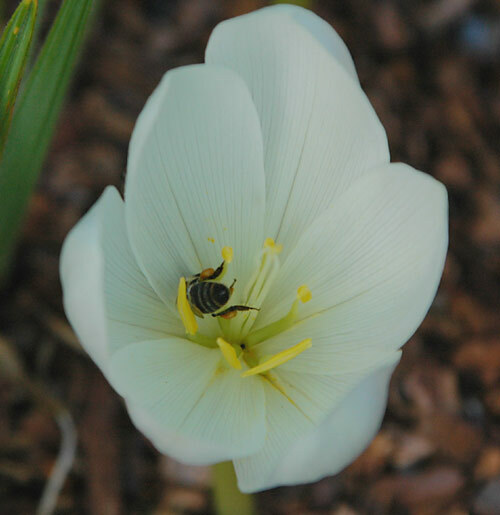 The third picture shows a bee rolling around in the flower. 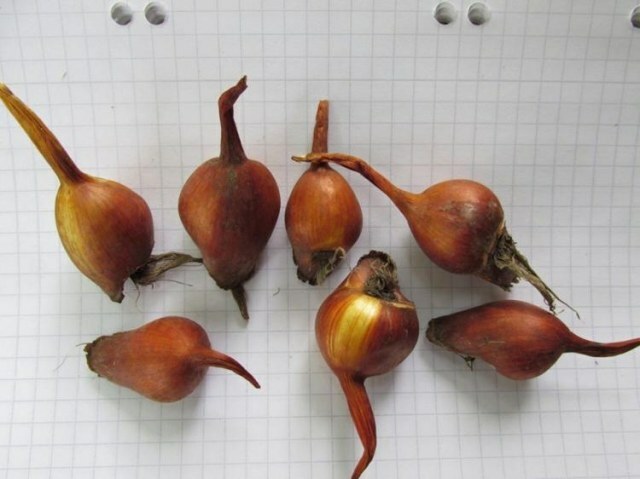 The last shows the corm on a 1 cm grid. 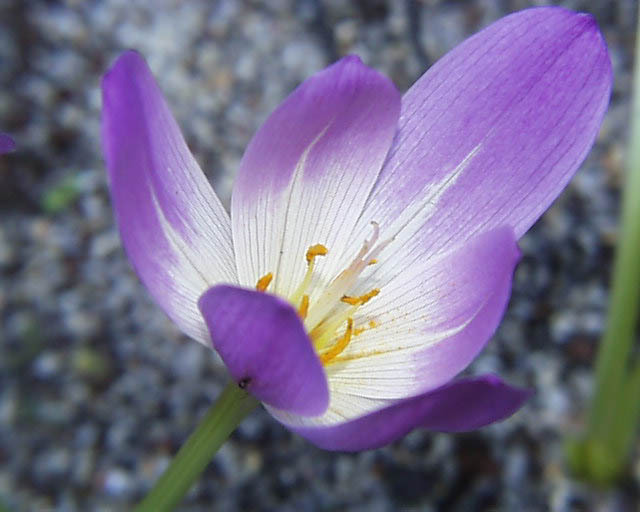 Colchicum sp. 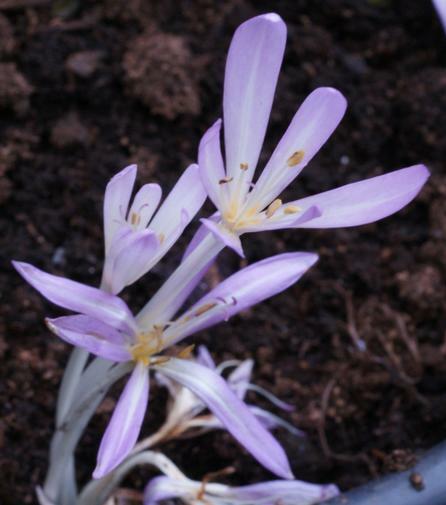 was thought to be the sterile hybrid Colchicum byzantinum, but is apparently not that species. 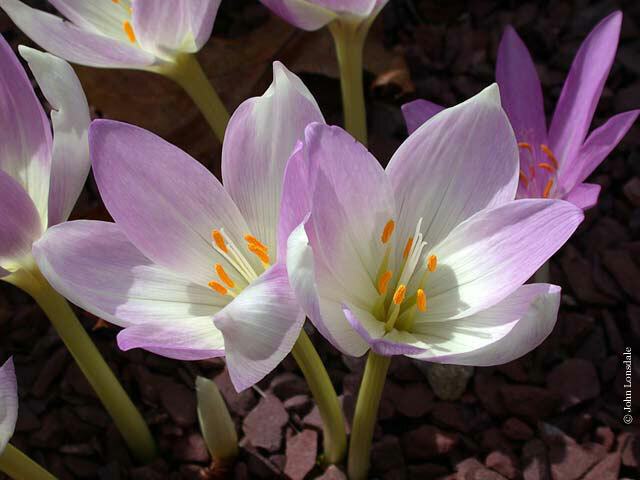 One guess is that it could be Colchicum cilicicum. 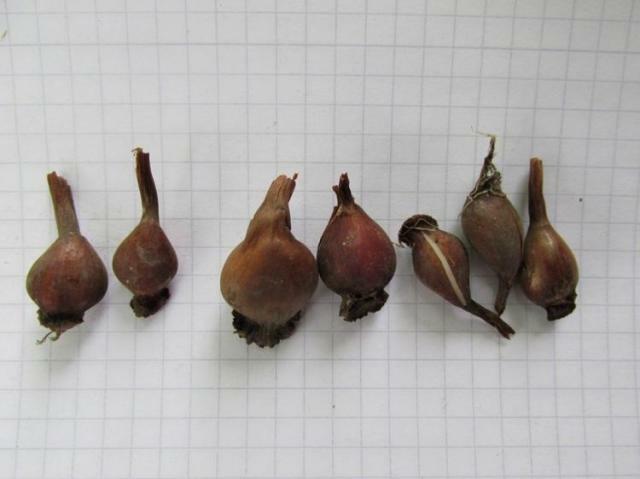 These plants do set a few seeds sporadically. 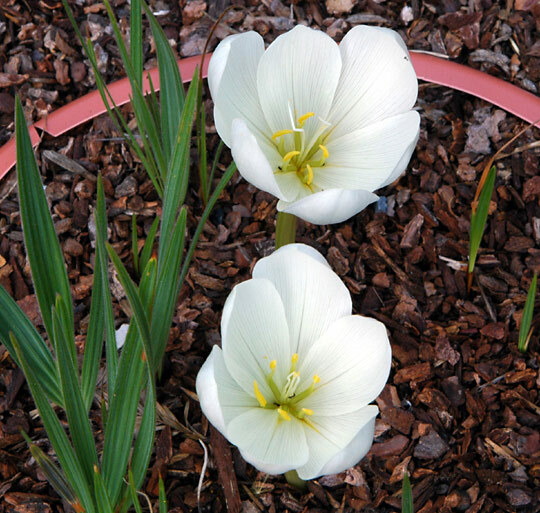 It is a strong grower, which multiplies fast with its large oval bulbs. 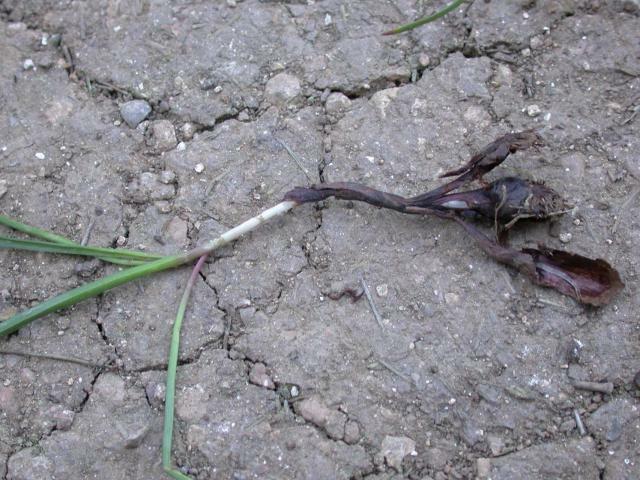 Leaves are very large too, with a well visible pseudostem. Photos by Angelo Porcelli. 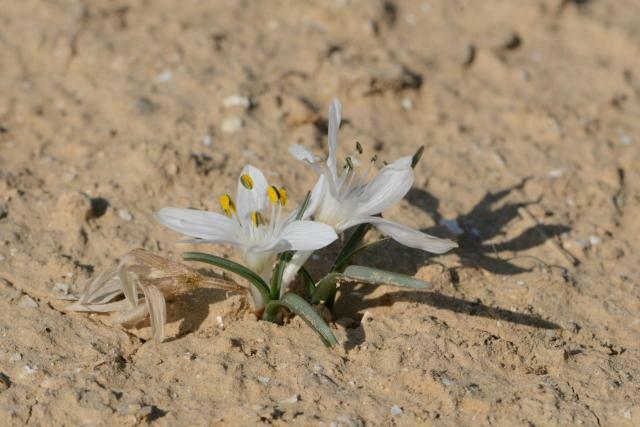 Photos by John Lonsdale of two more species yet to be identified. 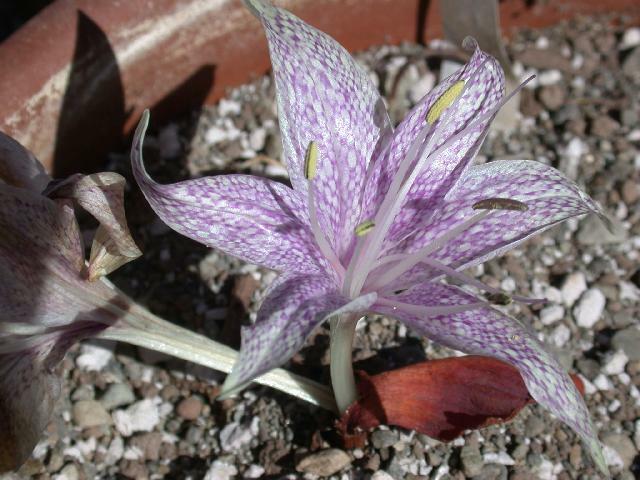 Colchicum stevenii is a species from Israel. 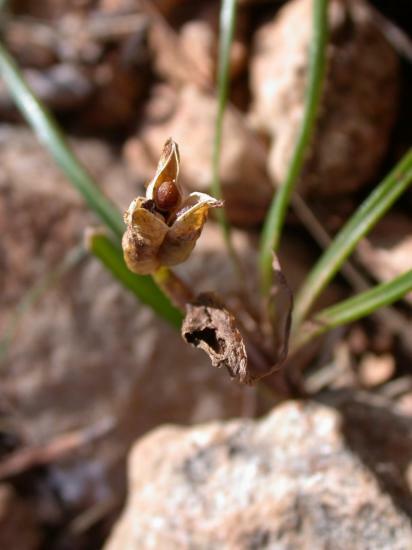 The leaves emerge after or during flowering. 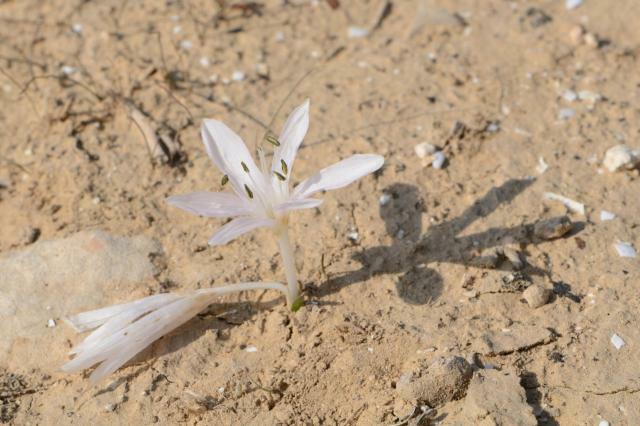 All photos of wild plants in situ by Gideon Pisanty. 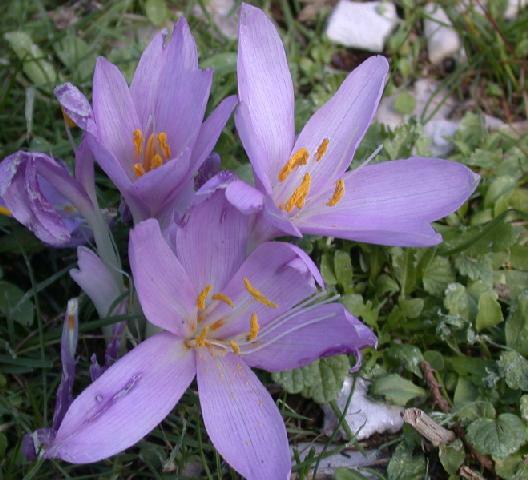 Colchicum szovitsii is a spring-flowering species native to the area of Turkey, Iran, and the Caucasus. 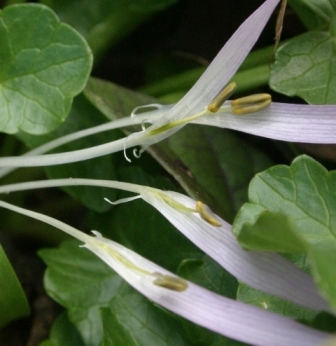 Flowers may be pink or white. 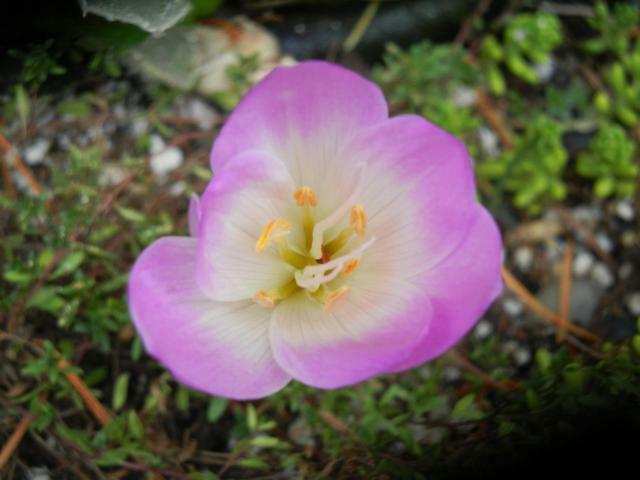 The first photo from Jane McGary shows a pink form grown from wild-collected seed from Turkey photographed in early February in a bulb frame in Oregon. 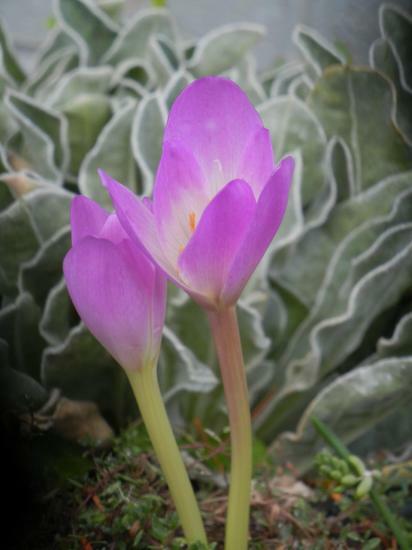 The last two photos were taken by John Lonsdale. 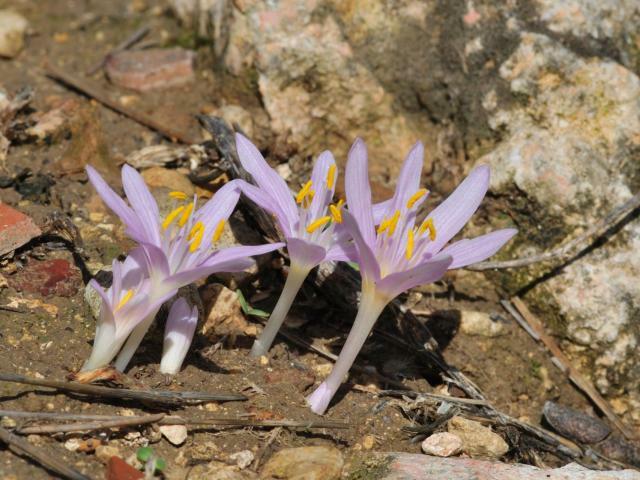 Colchicum szovitsii ssp brachyphyllum Photo of corm from Israel by Dr. Dimitri Zubov. 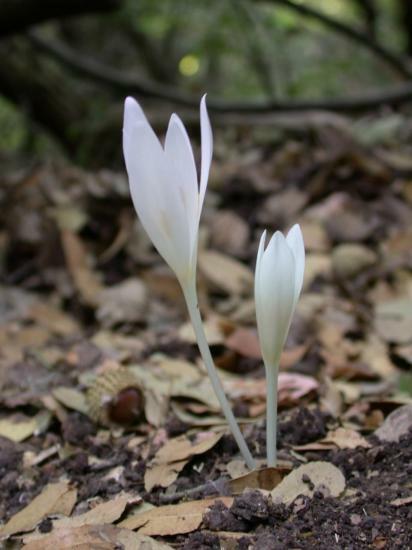 Colchicum szovitsii ssp szovitsii Photo of corms from Armenia by Dr. Dimitri Zubov. 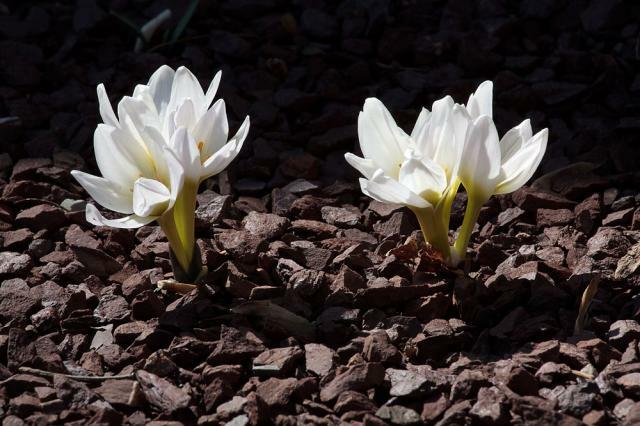 Colchicum szovitsii 'Snow White' Photo by John Lonsdale. 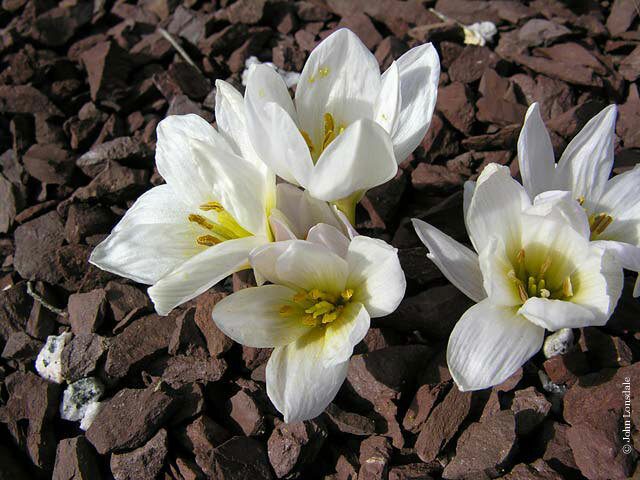 Colchicum szovitsii 'Tivi' is a white selection found by Janis Ruksans. 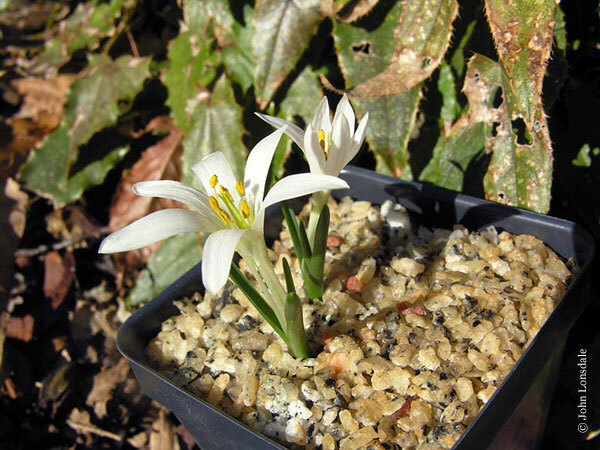 According to one description this species has dark anthers, but these plants have yellow anthers; nevertheless I am accepting the collectors' identifications for them. 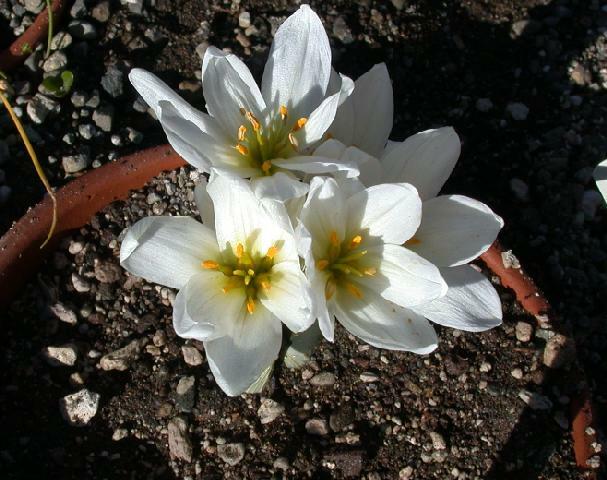 Photographed in early February in a bulb frame in Oregon by Jane McGary. 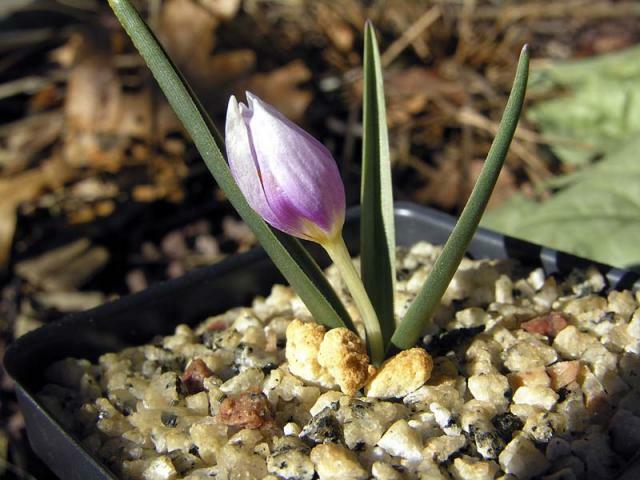 Colchicum szovitsii 'Vardaovit' Photos by Arnold Trachtenberg and John Lonsdale. 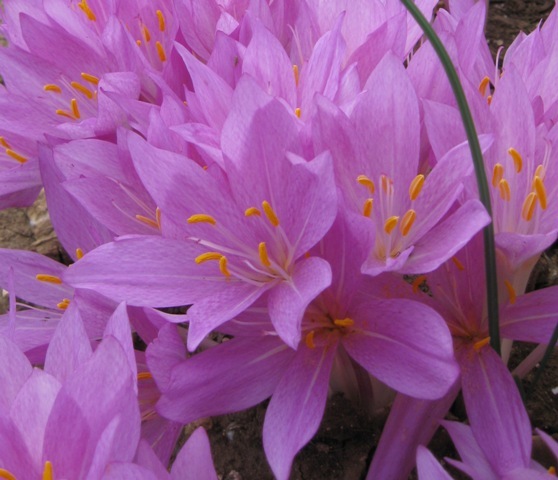 Colchicum tenorii - is a fall blooming species from Italy. 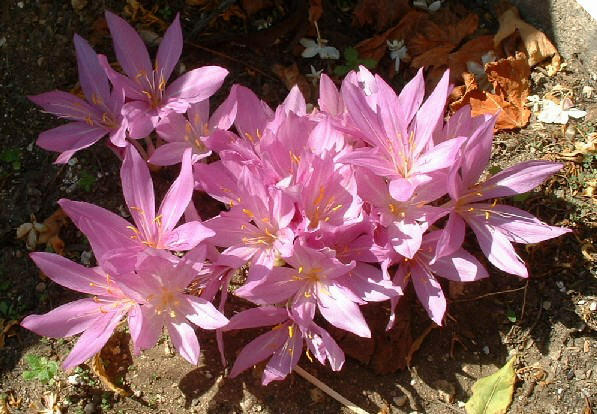 Synonymous with Colchicum tenorei and according to some sources Colchicum cilicicum. 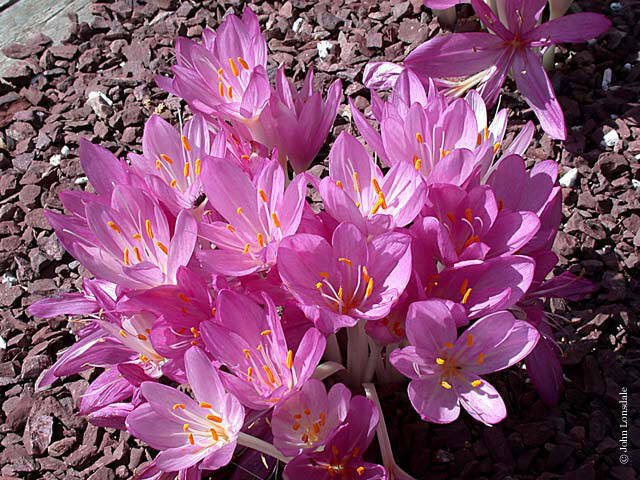 Often described as rosy pink, the purple styles are said to distinguish this species from Colchicum cilicicum. First photo by Arnold Trachtenberg, the remainder by David Pilling. 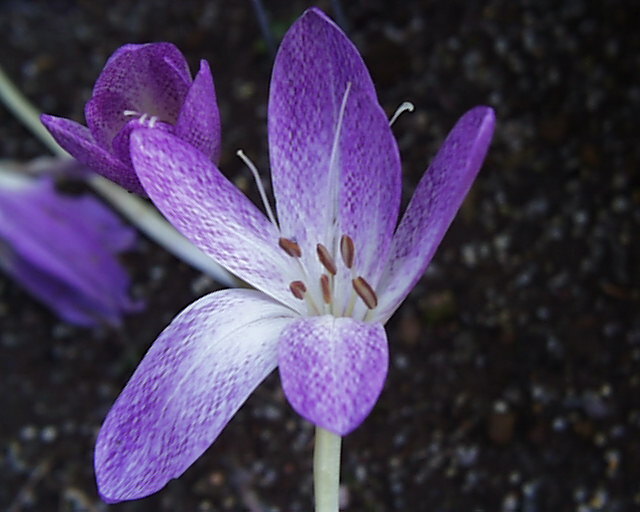 Colchicum trigynum (Steven ex Adam) Stearn (syn. 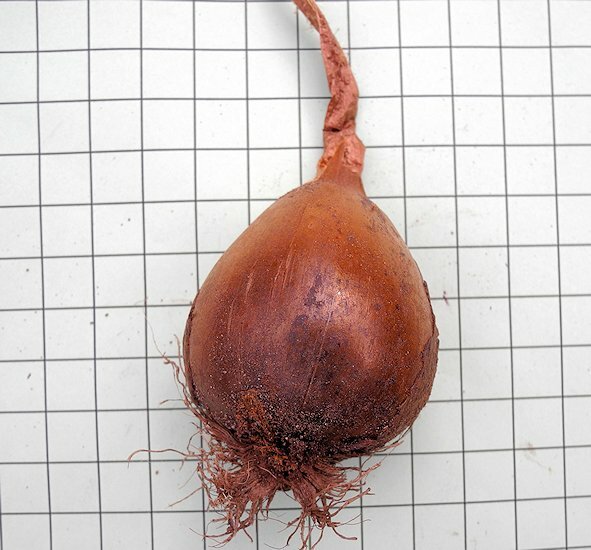 Merendera candidissima Miscz. 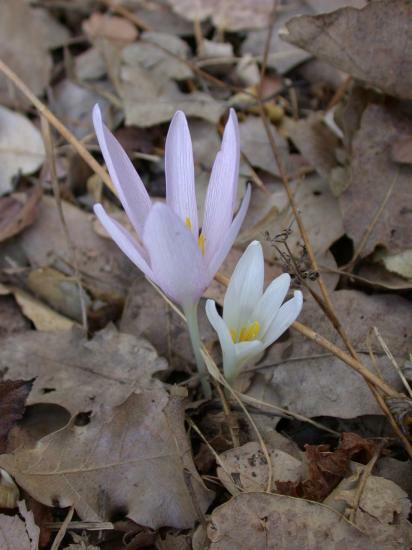 ex Grossh., Merendera trigyna) is a rare plant in Armenia and Azerbaijan forests. Photo by John Lonsdale. 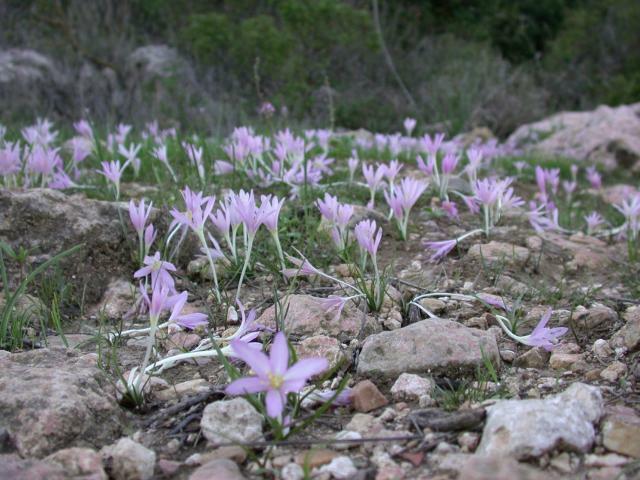 Colchicum troodi is a species native to Israel. Photos by Gideon Pisanty. 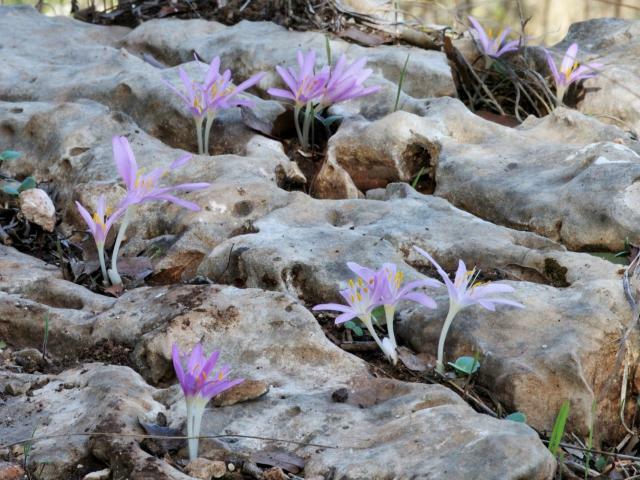 Colchicum tuviae is from Israel. 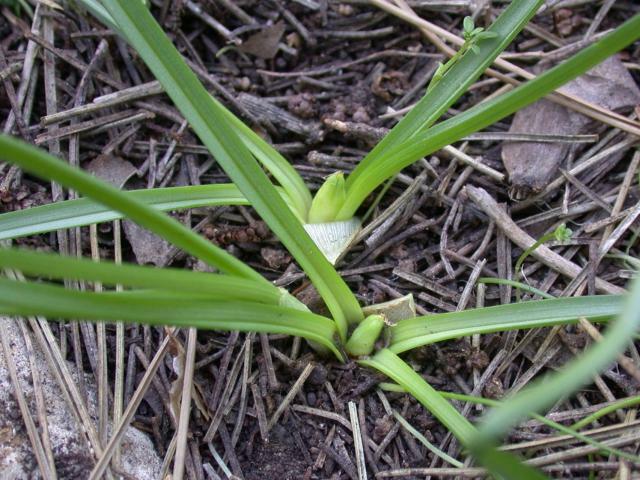 Leaves emerge during or after flowering. Photos by Gideon Pisanty. 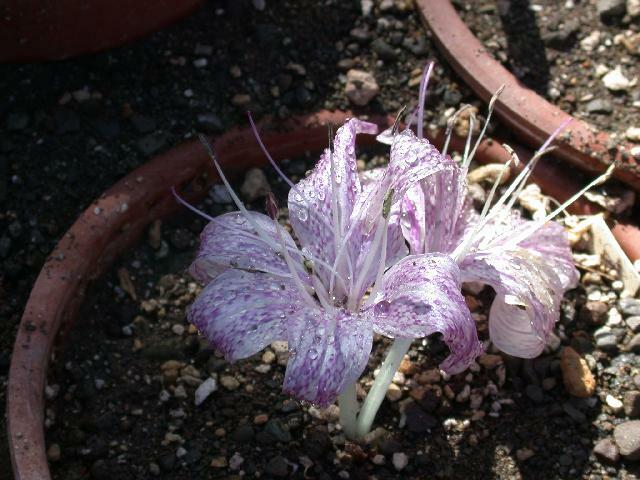 Colchicum variegatum from southern Greece and southwestern Turkey is regarded as a rather tender species. 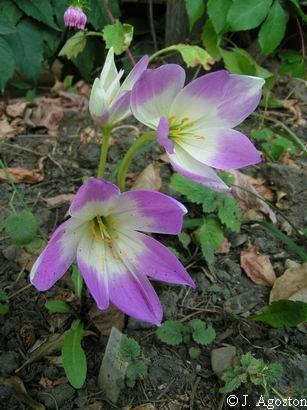 It is distinguished by its very strong tessellation (checkerboard marking) and is the parent of Colchicum × agrippinum, which is hardier. 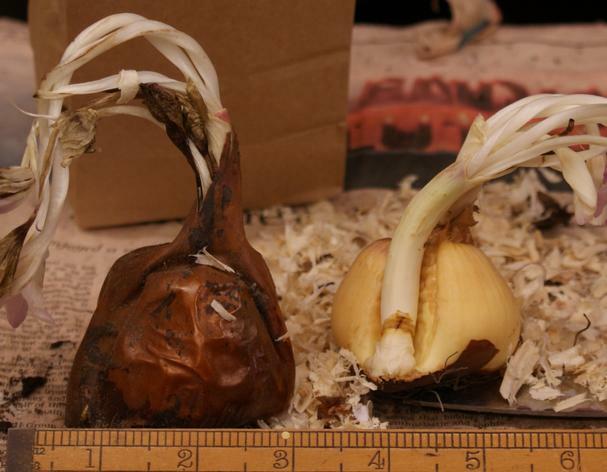 The first two photos from Jane McGary show (1) a bulb purchased from a European source and (2) a plant grown from seed purchased from the Archibalds. 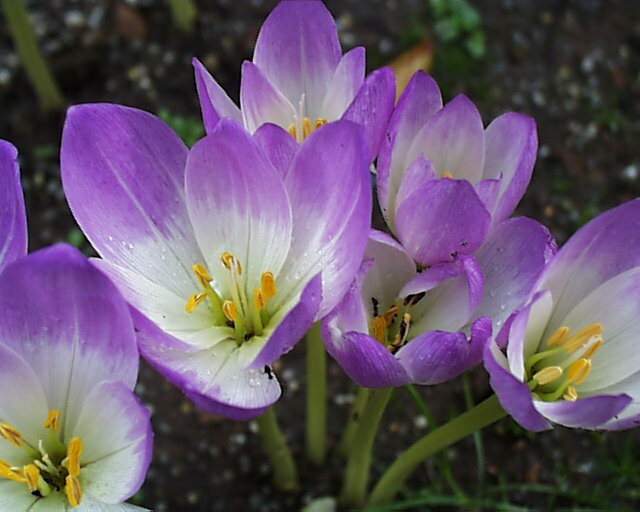 The last photo was taken by John Lonsdale.